Hey everyone! 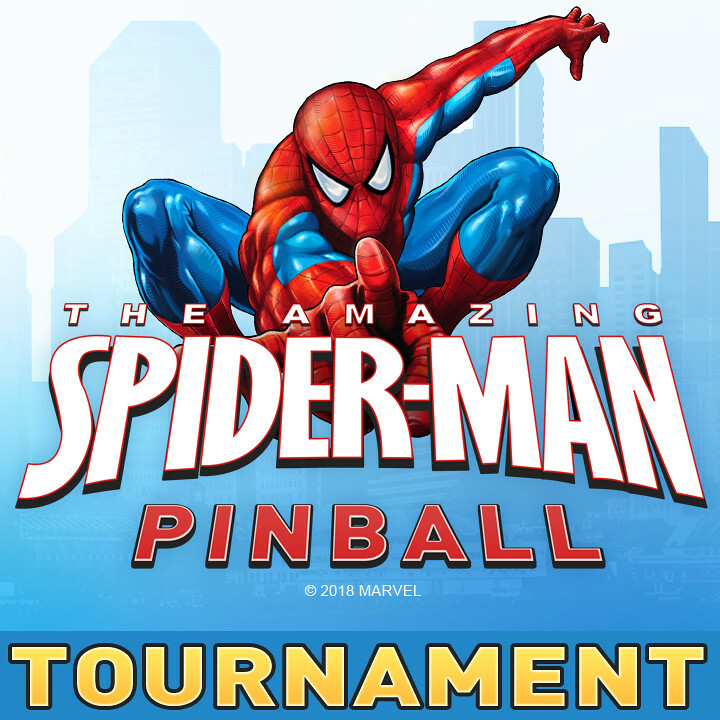 Get ready for some competitive fun as Zen Studios and Insomniac Games celebrate the release of Marvel’s Spider-Man for PS4 with a Spider-Man Pinball FX3 tournament. 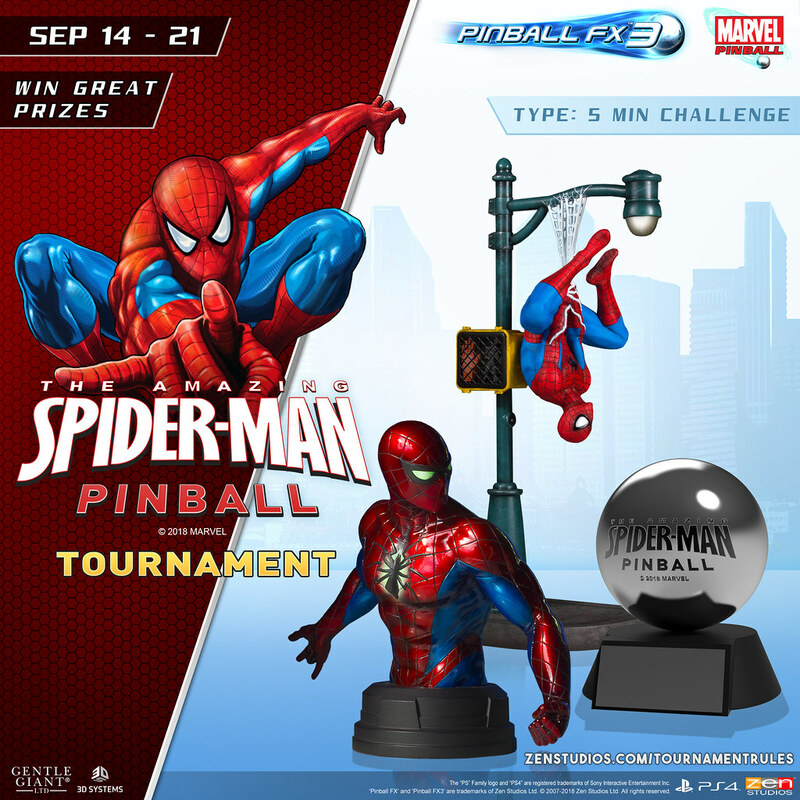 We’ve assembled some awesome prizes, including one-of-a-kind Spider-Man pinball trophies for 1st – 3rd place, as well as other amazing Spidey-themed prizes and gift cards for random participants. The tournament, is LIVE NOW through September 21 – only on PS4! Tune in to Insomniac’s stream on September 19 to see how Marvel’s Spider-Man developers fare while playing the beloved Spider-Man pinball table, which also features the voice of Yuri Lowenthal! If that’s not enough, we at Zen – along with our pals at Insomniac – are going head-to-head on the Pinball FX3 table for some friendly (or maybe not-so-friendly) competition! See which of our teams has the keenest Spider-Sense and comes out on top. You can even participate yourself by downloading Pinball FX3 for free, then acquiring the Spider-Man table through the Marvel Pinball Original Pack or the Marvel Pinball Season 1 Bundle, which itself includes 11 of our 23 Marvel Pinball FX3 tables. And yes – there’s a demo! And what was that about amazing prizes? The high-end collectibles geniuses at Gentle Giant – the same company behind the spectacular Marvel’s Spider-Man Collector’s Edition statue – have created limited-edition Zen Studios trophies just for this event! We even have prizes available for those whose scores don’t top the charts. We’re giving 5 random participants platform gift card credit. To enter: Take a screenshot of your PS4 play with the Share button, post it to Twitter tagged to @PinballFX and add a caption that amazes us. It can be funny, it can be profound, it can be a super-helpful tip for fellow players – just make it awesome, and five winners will be chosen at random after the tournament concludes. Finally, Pinball FX3 fans will be happy to know that all participants will receive a Spidey-themed profile background along with exclusive portrait frames and badge. For more details about this event visit our blog at blog.zenstudios.com. Thanks for the compliment OnTheBus5666! Very cool. Looks like I’ll be knocking around some silver and pumpkin shaped balls over the next couple days. Love the cross promotion! I love the Pinball tables in FX3, and I can’t wait for more. I’d love to see more Bethesda tables (like Wolfenstein, Prey, The Evil Within), and tables based on [adult swim] stuff. On my first tournament try – first time I’ve touched the Spiderman table in at least a year – I ended up ranked 105. Not too bad, I thought, given the thousands in the tournament, right? Nope. It’s a shame PS3 players can’t import these tables when from when the game was free on PS3 PSN had one of the top scores before the leaderboards were reset! good luck to people playing tho!